I understand that I am beating the proverbial dead horse, but we are due for something big. Over the last 3+ years we have seen below average, and in most cases, way below average precip here in Tahoe. It is even worse south of here. Averages exist for a reason, the world does not change overnight so I still fully expect a major pattern change to usher in a very wet spring. Having said that, I can base this on no scientific data, historical data, weather trends, oscillations or anything else, at least not consistently. By no means am I complaining about the near perfect weather that we have seen around Tahoe for quite some time. But, enough is enough, we live in the snow belt and it is about time we got some snow. 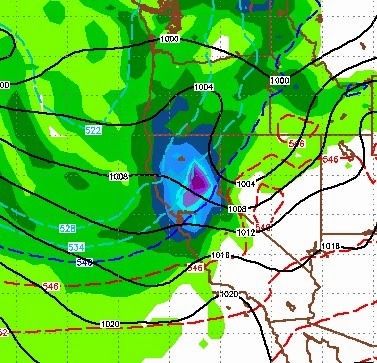 The GFS weather model, for the past couple of days has been hinting about a pattern change. That change could come as early as the 26th or as late as the first of March. Interestingly enough, today the EC weather model joined the party. 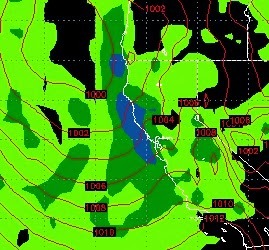 The GFS is more aggressive, but EC showed nothing yesterday. Ok, I know this is a ways off. However, this is how I used to make long term forecasts; get the models on the same page and then write with confidence. Of course after the last several years the confidence is a bit shaken, but you can judge the evidence for yourself. I will keep a close eye on this one and report accordingly. Our well above average temps are going to take a shot starting this weekend. We will warm again early next week and then we are in for a much extended cold snap ... no below zero stuff but enough to resurface the ice each day and freeze it each night. I know the gang up at Sky Tavern are running a community hockey rink and are chomping at the bit to play. Hopefully this will help. Rumor has it that Browns creek finally filled up the pond and they have the entire surface to skate on. I know they are looking for volunteers so if you are interested, shoot me an email and I will get you in touch with the right person. For those of you who are interested here is the most optimistic 30 day we have had all year. Of course, until the snow is on the ground and you are ripping through it, take this with a grain of salt! 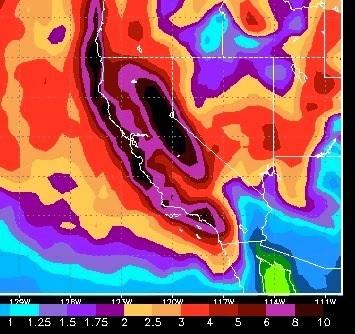 Yes all of Tahoe and the Carson range are slated to pick up over 10 inches of liquid precip in the next month ... does that start in about 10 days? I am employing every pagan ritual at my disposal. I've got people doing rain dances, car washes, virgin sacrifices (though admittedly, they're hard to find out here in Los Angeles) - kidding on that last one. I missed last year's season due to the dismal conditions, and broke my arm the year before at Mt. Rose. 3 years ago we had an epic dump the week we were there so I'm hoping for a repeat. So thank you for this blog.